Note: This is a guest post by Breanna Hamm, which also appears on Breanna’s personal blog. Breanna works at the University of Michigan Hatcher Graduate Library as an Instructional Technologist, and is also an awesome graphic designer and activist. Please check out her website for more information about her! Maker Faire came to the Detroit area this July by stopping at the Henry Ford Museum in Dearborn, MI. 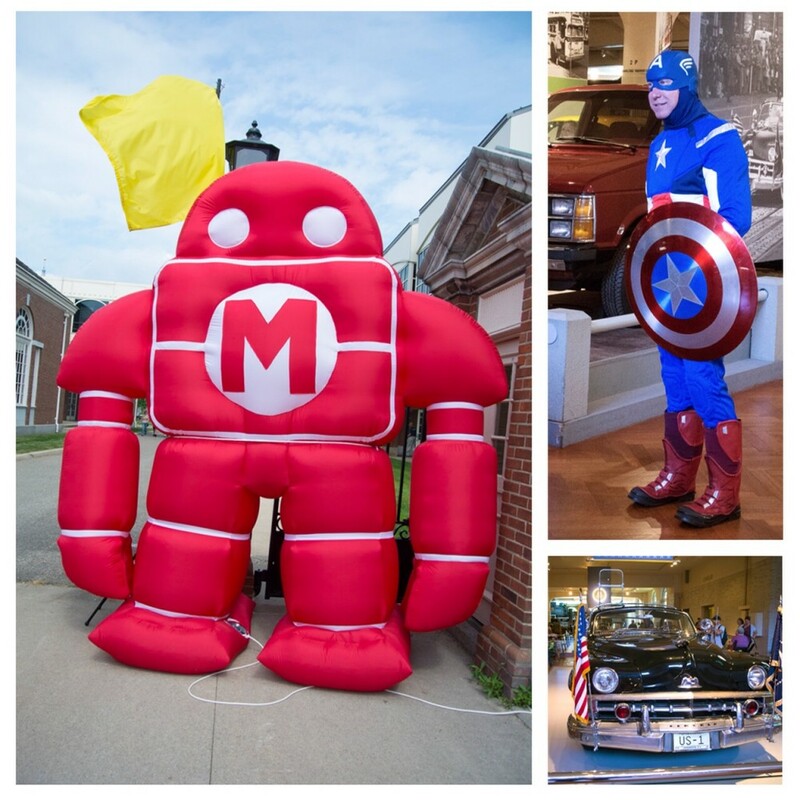 The museum provided a historic backdrop for the celebration of innovation and maker culture. Maker tents and tables could be found woven throughout the museum and outside in the Henry Ford parking lot and driveway. Hundreds of people were in attendance, moving from gadget to gizmo, checking out the creative work by makers featured in the faire. This was my first time attending a Maker Faire event and this carnival of exploration, gadgetry, and tech was more elaborate than I could have ever imagined. I quickly learned why this was a two day event because it’s easy to find yourself engrossed in the activities at a table or in the middle of a 20-minute conversation with a maker or fellow attendee! The atmosphere was warm and welcoming and makers were willing to give you their best elevator pitch or let you test out their latest creations. From innovative to bizarre, there were varying and unique approaches to the maker idea, which made for quite the memorable experience! As a first time attendee, there were quite a few things that really stuck out to me and which I have highlighted below. I was not expecting to learn as much as I did in one weekend, but I walked away with a vast new pool of knowledge. Do you know how to pick a lock? Because I do from attending one of the responsible lockpicking presentations given by Toool. Do you know how to build a birdhouse? Habitat for Humanity Detroit showed me the steps to build a wooden paradise for my winged friends. I could go on, but I think you get the point. The amount of knowledge these makers bring to one place in unfathomable, so don’t be shy to chat with folks or get your hands dirty. I applaud that makerspaces strive to be inclusive and the inclusiveness of this faire was incredible to see. Everyone was encouraged to participate in events and there was truly something for every person at the faire. I never dreamed that I would have considered myself a maker, but this event is almost like an orientation to maker culture, and before the weekend ended I was wearing an “I’m a maker” button on my lanyard with pride. Don’t worry if you’re not a maker before to go because you will be before you leave! I did not know I had an interest in LED lighting until talking with folks at Protofusion and witnessing the fascinating Hypnocube. Thanks to Liter of Light, I was able to act upon my newfound interest and built a battery-powered LED light in a jar (it even changes color). Upon returning from the Maker Faire, I’ve already purchased some LED light strips for myself and cannot wait to experiment. I was impressed by the number of youth who were makers and also their incredible knowledge and skills. I had the pleasure of speaking with two youth who demonstrated a driving LEGO car, which they had built and programmed to follow a track around a small city. The car was controlled by a smartphone app and the user could select a location, like the Solar Station, and the car would drive to that point. I was fascinated by their cleverness in building this setup as well as their public speaking skills and knowledge. Several robotics clubs, high school and college groups, and other youth projects were on display at the faire. In addition to youth featured booths, there were many booths and activities that were specifically targeted toward or were inclusive to youth. Some of the activities at this year’s faire included Minecraft games, robotics booths, Hot Wheels ramps, musical fruits and vegetables, and model cars, and more. I enjoyed seeing such a strong presence of youth and it help diversity the event and make it fun for families and groups. Something I most enjoy about maker culture is that often intersects with geek and popular culture. I would by lying if I said I wasn’t giddy when I saw folks strolling the halls in movie-quality costumes of Chewbacca and Darth Vader, or when I spotted a Mad Max themed car in the Power Racing Series race. Several vendors featured artwork of their favorite pop characters and folks of all ages were in costume or getting photos taken with those who were. Star Wars cosplayers and figures. 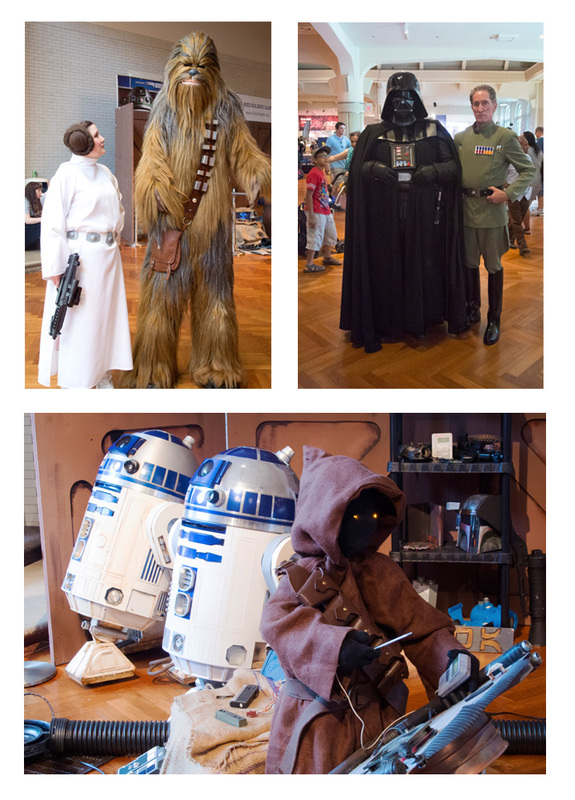 Top Left – Princess Leia and Chewbacca; Top Right – Darth Vader and Imperial Officer; Bottom – Two R2-D2 droids and a Jawa. There were a few things I learned this year as a first time attendee that I wish to pass on for others who may be attending a Maker Faire event for the first time. Get a release wristband so you can participate in all the events and activities throughout the faire. Bring the youth. Many activities are geared toward youth 6 and older. One day may not enough to see everything there is to see. Consider attending multiple days. Follow Maker Faire hashtags on social media to scope out interesting or trending activities. Certain activities happen only during particular times so download the Maker Faire app for a schedule of events. Take both photos and video. Some items are best captured by video. Network. This is an opportunity to meet new and interesting people or find ways to pursue an interest you may have. If you are unable to attend an Maker Faire-led event, consider searching for other maker events in your area. Did you attend Maker Faire Detroit? 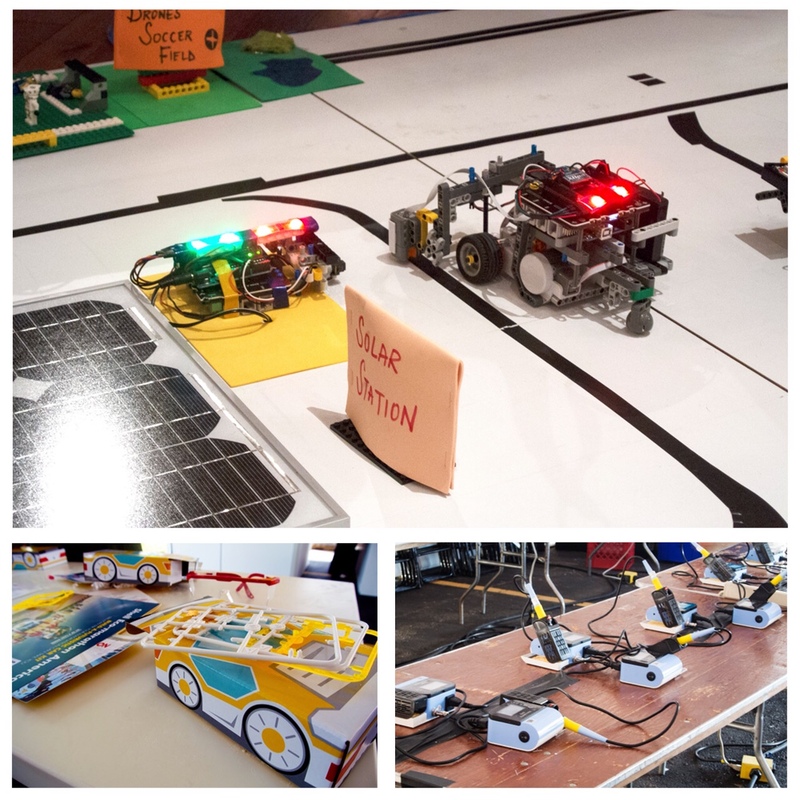 Have you attended other maker faires? Share your favorite memories or thoughts in the comments or on Twitter!